Stop by the club desk on Wed! 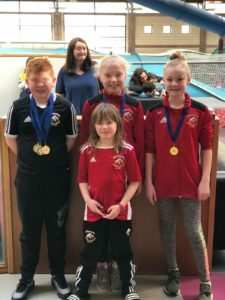 It was a busy weekend for PASC when on Sat 6th April Sliabh Beagh Open took place and PASC hosted their first water polo games at Cascades. 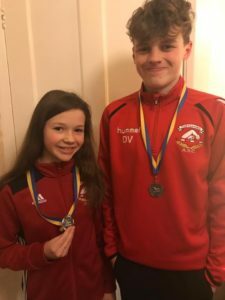 Then on Sunday 7th April, we had 13 swimmers competing in the Bangor open and then the 2nd session of Swim Ulster’s Skills Meet in Lurgan. Well done everyone. Results are on meet mobile and pictures posted on the club facebook page. PASC will be hosting some games in Cascades against clubs from Belfast. This will be a good opportunity for parents to watch some full competitive games so please come down and support this even if it is to see what mini polo is actually about or even if you are just curious. 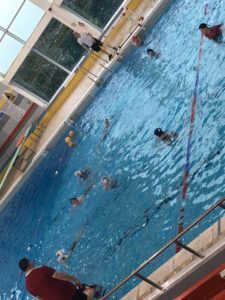 Waterpolo training continues every Saturday at 9.00 am unless there is a club gala – if you are not already taking part, just come along and join in. 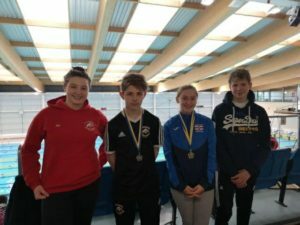 Irish LC Open Championships NAC: Well done to Lillie-May who qualified for the 2019 Irish Open Championships and swam the 100m fly event. 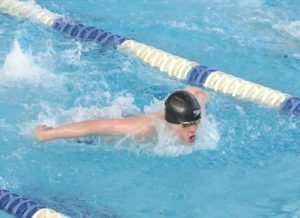 This is the first time PASC had a swimmer compete in this competition. Fantastic achievement Lillie-May – we are so proud of you! 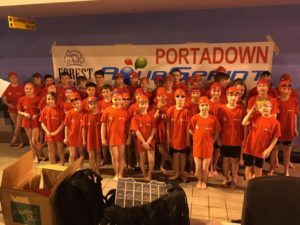 Our junior swimmers had a close gala AWAY gala in Larne on Saturday with lots of great races, and a friendly atmosphere. Congrats to Larne. Thanks to all who helped and made this a very exciting gala for the young. Aquasprint parents please confirm at the desk how you can support the HOME gala on 13th April please. Great swims in the PTL Finals last Saturday: Alisia, CJ, Daniel McD, Darragh, Dmitry, Ella F, Emma R, Jasmine, Jodi, Joshua, Lauren, Max, Megan & Ryan F with PASC one of the top clubs in the PTL South Region. It was a very close gala with the North Region just edging it! Pic on FB. Times should be on meet mobile in a few days. 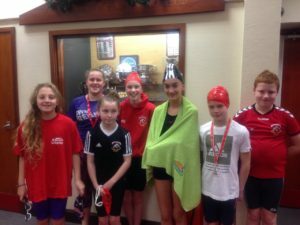 Well done to all 11 PASC swimmers: Alex, Anna, Daniel, Dmitry, Ellen, Hannah, Jessica, Lillie-Mae, Max, Megan and Ross who competed in last weekend’s gala at Bangor. Once again, our swimmers achieved personal bests with 19 top 6 places including 3 gold, 4 silver and 3 bronze medals. Congratulations! Great to see Darragh, Eóin & Leon at the U13 Skills Camp & Match on Friday night in the Grove Leisure Centre, Belfast. Our players are really coming on. If you are interested, then come along to training on Saturday morning 9-10 am. The U9 skills camp & match will be on Friday 22nd March at the Grove. You just need to register at the club desk or speak to one of the coaches. 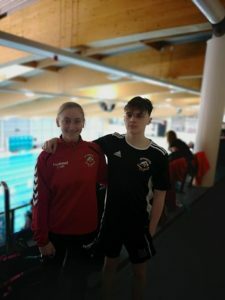 PASC senior swimmers took part in the Ulster Grammar Schools Swimming Championships afternoon session at Larne Swimming Pool on Saturday. All events that #wearepasc swimmers took part in were 50m short course format. All four made the finals and picked up some medals. Anna. Silver in Free. Megan. Gold in Breast and Fly. Lauren. Silver Breast and Back. Daniel. Silver in Back and Fly. 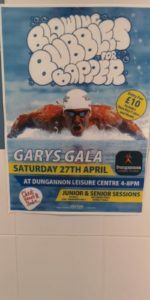 Well done and thank you to Jonny and his team at Ulster Schools Swimming for organising and running the gala. What a great weekend for our Club. 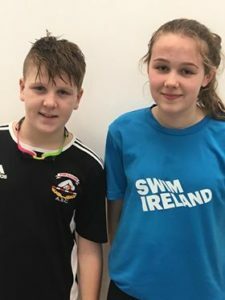 After our fantastic achievement yesterday action continued in the water this morning with Daniel and Lillie – May competing in the Dave McCullagh International at Bangor. 1 PB for each of them over the weekend following 3 swims and a very busy schedule yesterday. Well done guys ! 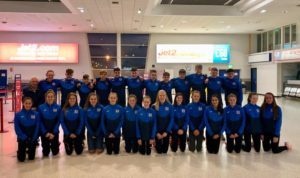 A total of 13 swimmers from PASC competed in the Templemore Minor Gala on Sunday despite attending the demanding PTL gala the previous evening.Notwithstanding this the swimmers gave an outstanding performance with numerous medal positions, PB’s and even some Div 2 Qualifying times. 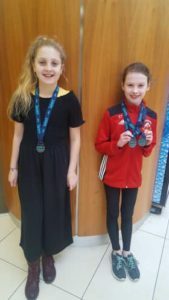 The swimmers attending (in the pic) were Alex, Alisia, Anna, Annie, sisters Emily & Lucy, sisters Emma & Jodie, Ella, Jessica & Leon and (not in pic) siblings Colm & Katie Diver. Outstanding performances from all! A special note to Leon Ruddy for achieving the top swimmer award in his year group with 4 first places in 25m Free, Fly. breast and back strokes. Also to Emma Richardson for achieving Div 2 Qualifying time in 100m Fly.and Jessica for achieving a Div 2 time in 100 Fly for the second gala running. For the statisticians amongst you here are the stats. 13 swimmers achieved a total of 33 PB’s from 42 swims, 8 Gold places, 2 Silver places, 2 Bronze places and 2 Div 2 Qualifying Times. Well done PASC! There should be at least 1 parent from each PASC family who has an up to date Safeguarding (a.k.a. Child Protection) certification. Swim Ulster are running a few courses locally in the coming days/weeks. We would advise that any new members attend one of the above courses ASAP, and any existing parents/coaches/committee whose certification expires within the next 6 months should attend also as it might be some time before we are able to run another course at Cascades, and it is critical to the running of the club that existing members don’t let their current certification lapse. Please email portadownasc@gmail.com if you need further information or view Education & Courses via https://swimireland.azolve.com/Workbench/Home. Well done to our junior swimmers to took part in the first Forest Feast Aquasprint Gala of the season with many attending their first gala. PASC met a strong Lurgan and results were close in the end LASC 219 V PASC 181. Keep training, lots of more galas coming up. Thanks to Lurgan for hosting the gala and to all the parents who volunteered. 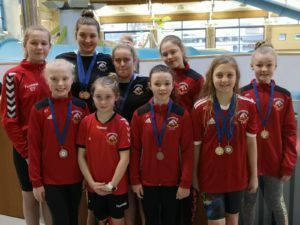 15 PASC swimmers competed in 40 events at the 2nd Swim Ulster Development Gala of the season. Between them they achieved many PBs and qualifying times in addition to 19 podium places: 3 Gold, 10 Silver and 6 Bronze Medals. Hard work pays off! Excellent swimming! 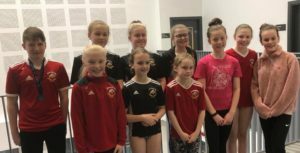 Well done to all the PASC swimmers who shaked off the selection boxes, got back to training this week to prepare for today’s Newry Open Meet. It paid off with some great personal bests on display! Our 100 swimmers had a fantastic time at Air-tastic on Saturday – visit the club Facebook page to see the photos! Many thanks to Petra for organising such a fun Christmas event. 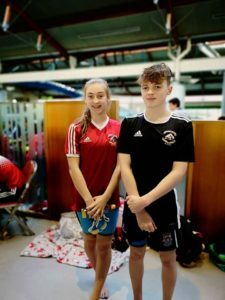 Daniel and Lillie – Mae on Saturday morning session at the Irish National Short Course finals just before they both headed off and swam 1.5 sec PBs in the 100 Butterfly. Well done guys hard work = great results. Fantastic to be hitting these times so early in the season and to have 3 swimmers at this event. Sadly Megan G had to withdraw due to injury. 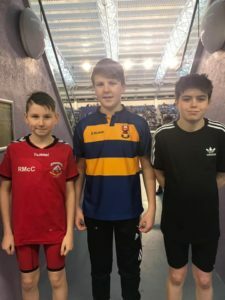 Well done to our team who competed in Friday’s mini water polo event in Belfast. Great skills in action – please visit the club Facebook page for photos. Thanks to Ian for leading this initiative and to Conor for supporting the tournament. Skills Camp coming up on 27th Dec for swimmers born 2003-2006, more details on club newsletter. 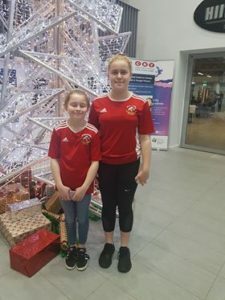 8 swimmers along with Coaches Conor & Ian hadn’t long left the PTL Gala at Dungannon Leisure Centre on Saturday night to make an early start east to the Ards Junior Christmas Gala. It’s the last Christmas Gala at the pool as they look forward to their shiny new pool in 2019. 7 swimmers were in action in the morning, with Alex swimming in the afternoon. Between them they secured 9 top 5 places including 4 podium spots: 2 x 1st, 1 x 2nd and 1 x 3rd. Well done everyone for your commitment and dedication. Our PTL team were AWAY to Dungannon on Sat for the 4th gala of the league. Great team effort by everyone, many of the events were very close! Thanks to our hosts Dungannon, great atmosphere! Results: Dungannon 542 V PASC 602. A special thanks to the following parents who volunteered at Dungannon on Saturday night: Timekeeping parents – Sharon Vennard, Beatrice Gellately, Stephanie Archer, Veronica Dempsey, Janet Richardson and Natalie Corrigan. Touch judge – Michael Johnson. Marshals – Fiona Todd, Alan Campbell. 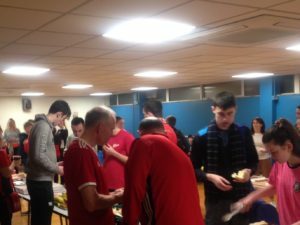 All PASC coaches – Conor and Ian also made it a double header when they supported the swimmers in Ards the following day! Be sure to check the gala list on the Wed night before the gala to confirm your attendance. We try to give everyone a swim throughout the season, so if you can’t make it just let us know and we’ll give someone else the opportunity to represent PASC. Best wishes to Lillie-May who was selected to join Ulster Schools’ Swimming Training Camp in Tenerife during mid-term. 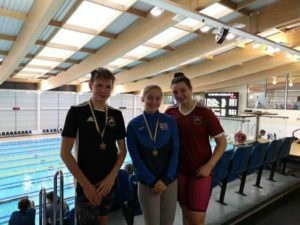 Well done to all PASC Swimmers who competed in the Swim Ulster Schools Cup & Championship event. 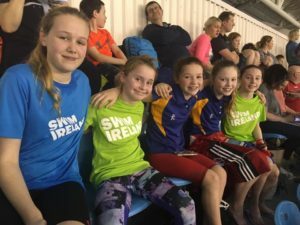 Congratulations to any first timers, swimmers who encouraged their team & other PASC swimmers, those who achieved PBs, final & podium places and a qualifying time for the Irish Minor Gala at the National Aquatic Event in Feb 2019. Photos on the club facebook page. 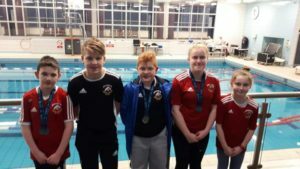 Congrats to 7 PASC swimmers who competed in last weekend’s Swim Ulster Qualifying Gala. 5 podium places achieved: Daniel 3rd 200m back, Lillie-Mae 1st 50m & 3rd 100m fly, Ross 2nd 50m & 200 breast. In addition, 6 x top 6 final places were achieved by Daniel, Hannah, LM & Ross. Well done to everyone on your PBs👏. This is a recognition of the long course training these swimmers have been putting in. 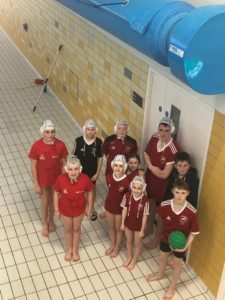 It was all fun and games at Cascades on Saturday when PASC had it’s first water polo session, which was overseen by the Club’s newly qualified mini water polo Coaches. Our thanks to Ian for leading this initiative and it was clear everyone had a great time. Mini water polo will continue each Sat 9.00 -10.00 (Except for gala days). If you are over 13 and interested in learning water polo skills please just register your interest at the club desk. 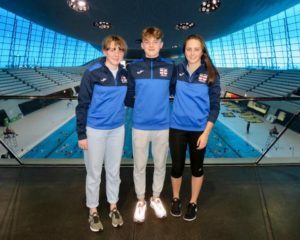 On 15th – 17th September, a selected team of 23 swimmers from Ulster Schools attended a 3-day training camp in the London Aquatic Centre. 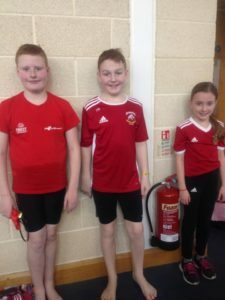 We are proud of 3 PASC swimmers below who qualified: Anna, Daniel & Megan who trained hard, met new friends and had a great swimming experience. Pictures posted on the club facebook page. Well done! 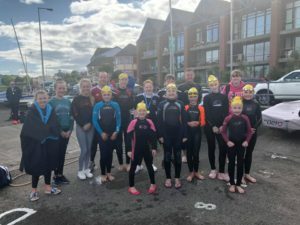 Well done to everyone who took part in Swim Ulster’s Open Water “Big Bay Festival” which was enjoyed by many swimmers and coaches. We hope to see you at more events in the future. Congratulations PASC. 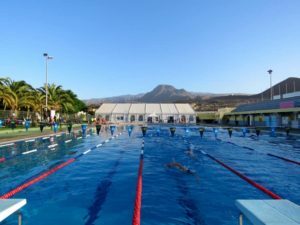 Starting this week on Thursday 6th Sep 2018 we will have a new time for Thursday evening swimming and we are trialling a new format which will hopefully lead to consistency across the whole year vs the split model we had before (PTL Jan to Sep; Aquasprint Jan to Jun). PTL aged swimmers (born 2006 or older) and in Red, Blue, Silver & Gold squads should swim from 5:30-6:30pm, hopefully straight after you’ve done your land training from 4:30-5:15pm. Older swimmers not able to make the earlier session will be accommodated as best as possible during the 6:30-7:30pm session when we have more pool space. Aquasprint aged swimmers (born 2010 to 2007) who have already competed in Aquasprint galas during 2017-2018 season should swim from 6:30-7:30 starting this week. For those still fairly new your coaches will speak to you over the next few weeks and advise you when to start attending. Aquasprint aged swimmers should only swim in the 6:30-7:30 session as we have limited lane space for older swimmers at 5:30-6:30. Please bear with us while we work through these changes to ensure that as many swimmers as possible can swim all year on a Thursday evening. Building on the enthusiasm & success of last season’s land training we are again running with it this season, starting next week on Thursday 13th Sep 2018. Please register at the desk on Wed night, and again there will be a small charge to be paid in advance for the term until Christmas. 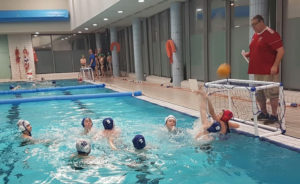 Following on from the survey completed last season by parents and swimmers it has been decided to introduce Mini-Polo to the PASC training schedule with the aim of playing internal competitions, friendly matches against other clubs and also enter teams in tournaments. The benefits of mini polo are well documented and include improving fitness and watermanship, promotes team skills, development including flexibility, cardio-vascular fitness and motor skills, strength, and also teaches game strategy, techniques and tactics amongst other things. The intention is to use 1 hour of the existing Saturday sessions (9 – 10am) starting at the end of September – date TBC. 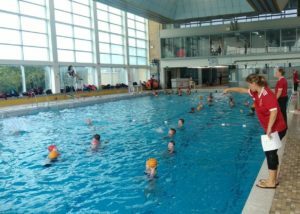 Normal swim training will continue during this period for swimmers not wishing to learn mini polo. We need to know numbers of swimmers who wish to learn this exciting new sport. 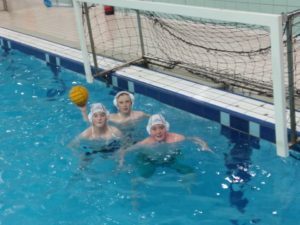 Whilst Mini Polo is for ages up to 13 we would welcome older swimmers who could learn water polo skills. To that end there will be list on the desk on the first club night back on Wednesday 5th September. This interested please put their name down. In addition any parent/swimmer not able to attend can register interest with any of the club coaches. On 22nd November 2017, Swim Ireland invited PASC’s Head Coach, Conor McKeown, to attend their Annual Awards’ Ceremony in Co. Mayo. 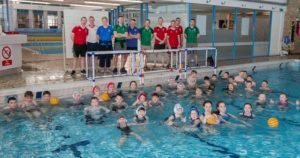 This event recognised the 2016 Olympians, International Swimmers and other worthy winners, which included PASC. Clubmark is a quality standard for sports clubs which PASC has been accredited with having evidenced compliance in the areas of club management, coaching, competition, safety and safeguarding. 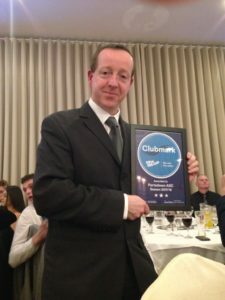 Only a small number of swim clubs in Ulster have achieved the clubmark accreditation. 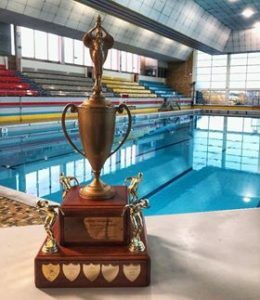 This award belongs to all of us – to our swimmers for their hard work and commitment, to the parents who encourage and support them, to the Cascades team for their positive partnership with PASC and to our parent volunteers who without, we simply would not have a club for all our swimmers to enjoy.